Come by the Codrington Farmers' Market this Sunday, June 4th, and you'll see me and possibly a young helper. CSA pick-up starts the following week but for now we'll have some late spring goodies on our table at the market. Hope to see you there! We have water! Other than the torrential rain that's been falling, I mean. The irrigation system is now mostly set up, having taken a slightly lower priority since lack of water pretty much the opposite of our current situation. If you missed the first post, check it out here for the background. The progress this time around: water lines, pump, wiring and valves are all installed and working. Here are a couple of electronic valves in the back field. This area is divided into two zones so that the pump only has to run half the field at a time. The valve on the right has just been triggered manually: success! The pump works, the flow and pressure are right on spec with what I calculated, and the wiring is all done. I ended up doing all of the trenching with my two-bottom plow rather than a trencher. Since a plow works by flipping a slice of soil into a furrow left by a previous pass, it's possible to make just one pass and leave a trench behind. If a plow has more than one bottom, it flips more than one slice at a time - each slice moving one width to the right and still leaving one open furrow. So the only downside with my plan was that since I couldn't take the second plow bottom off I ended up with a bit of a mess beside the trench, but I ended up getting it all closed up in the end. It feels safer to be up on a tractor instead of on the ground with a walk behind trencher and it saved me a trip (and some rental cash). Here you can see the main line and a bunch of direct burial wiring next to it. The main line is 1 1/4 inches, nice and big to reduce pressure losses in the long runs. Where it branches to individual valves, the short runs are 1 inch, which also matches the size of fitting that the valve uses. On the short runs to the boxes I had to finish up the trench with a shovel, but I managed to get all of the long runs done with the tractor. Here's the pump house that holds the pump and the controller. I built it out of scraps I had lying around so it's not the prettiest but we've seen some real weather already and it seems to do the job. At this point I've also attached all of the valve wiring (not pictured here). To help protect the wiring as is comes out of the trench, I've run the last 25 feet or so of all the wiring through some extra 1 inch water pipe, which runs directly into the pump house. All that's left now is to assemble the risers (plumbing from the valve to fittings on the surface) and program the controller. I've held off on these last couple of steps because of the ridiculous amount of rain we've had (the last thing any of my crops need is more water at this point), but I'm satisfied that the system is working properly and it's ready to go when and if things ever start to dry out. Thanks in part to a grant from our local chapter of NFU Ontario and Slow Food PEC, we're moving ahead with a new and exciting project this year: an automated irrigation system. I love finding ways to use modest applications of relatively inexpensive technology to solve big problems on the farm. It satisfies my need to tinker, improves the farm, and demonstrates that appropriate technology can help keep small farms viable without adopting industrial-style practices. This new project does all of the above and that's why I'm so excited about it. The basic plan is to install some permanent water lines in trenches to each of the fields and the two greenhouses. We'll bury sprinkler wiring along with these main lines and hook it up to electronic valves at various points around the farm. This will allow us to schedule on and off times from a central controller. We're going to be able to irrigate a lot more reliably and regularly with this setup, and the automation should save quite a lot of labour and save water by using it efficiently. We've just finished gathering all of the main components for this project, which (as usual) was a bigger job than it might first seem. Here's the truck loaded down with many hundreds of feet of poly tubing. A bunch of sprinkler wire and valve boxes. A box of electronic valves (we went with Rainbird PGA valves which seem to fit our use case without breaking the bank). And most exciting, here's a bench test (well, couch test) of the controller, hooked up to one of the valves. 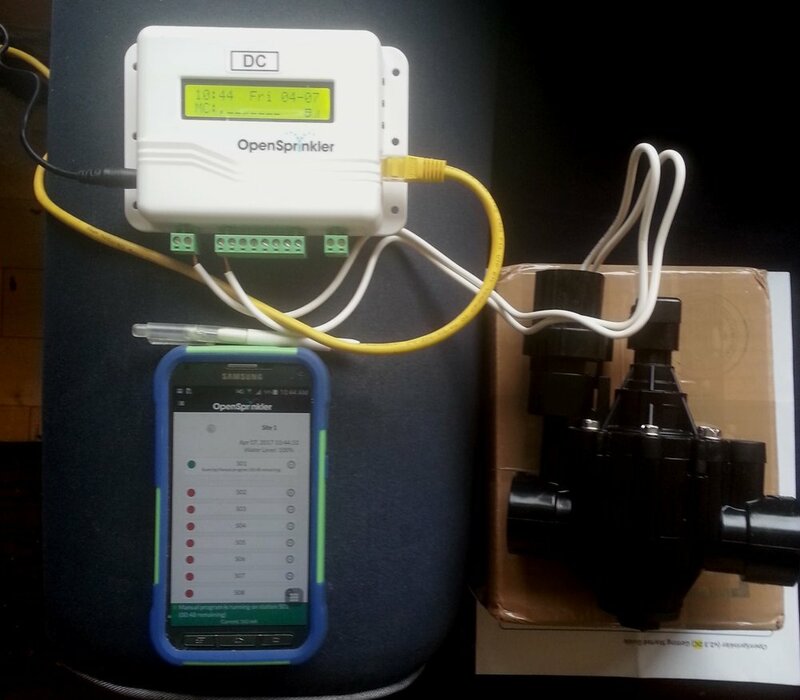 The controller (OpenSprinkler) is an open source, network connected sprinkler controller. Here I've got it hooked up to our network and plugged into one of the valves (on the right). I haven't set up any programs yet, but on the bottom left you can see I've used my phone (connected over wifi) to manually turn the switch on. I'm really looking forward to using this feature. Having remote access to the controller on my phone will let me walk around in the field and monitor, reprogram or override the system if I need. The network connection also lets the controller make weather adjustments (i.e. to run longer if it's hot, less if the humidity is high, and not at all if it's raining), which I got set up fairly easily by following these articles about Weather Underground integration from the OpenSprinkler knowledge base. Not pictured here: the hours and hours I spent tearing my hair out trying to figure out all of the right plumbing fittings to get everything working. Since I'm planning to hook everything up to drip irrigation, the installation will look slightly different than a conventional sprinkler system that you might see on a golf course. As a result it took some figuring to get everything sorted out. I'll post details of the solution I came up with in a subsequent post, once the parts are actually being assembled. Stay tuned for many more updates on this project as we move on to installation and testing! The day to learn about, talk about and sign up for CSA membership! Originally based on the day that statistically saw the highest CSA signups in the calendar year, now it's expanded to be a more general celebration of the awesomeness that is CSA membership. Check out Small Farm Central's website for CSA Day and scroll to the bottom of that link for a fun infographic on being a CSA member. Ready to join Eva Mae Farm's CSA? Signups for the 2017 season are still open! Enjoy #CSADay by spreading the word on the benefits of local farm membership! The days are getting longer and we're getting ready for spring! Seeds, seeds, seeds! Seed orders have arrived and seedlings will soon be growing either in the greenhouse or under the indoor plant lights. We can't wait to get the growing season started! Signups are now open for the 2017 CSA season! We're excited to be returning to Toronto with delivery shares after downsizing temporarily in 2016 to grow a baby. For our returning Toronto members there are a few changes from our 2015 season to allow for more options. Contact us if you have any questions. We're also VERY excited to be heading to the Codrington Farmer's Market every Sunday 10 am - 2 pm from June through October. Local members can pick up their boxes at the market or contact us to make other arrangements. We will also have delicious farm fresh veggies available for anyone who drops by. Come check out our market stall! Not to be confused with the salad dressing that shares its name, vinegret is a traditional Russian salad that's always found on the table at a dinner party or festive gathering. It's popular both because of its colourful look and the fact that it's made from hardy storage veggies that can be pulled out of the cellar in the depths of winter. Growing up in a household of Russian emigrees meant vinegret was present at every single celebration, although picky kid eater that I was, I usually wanted nothing to do with its vinegary flavour. With a more grown-up appreciation for this vibrant salad, I decided to oven roast the beets and carrots instead of boil them so as to better bring out the earthy sweetness of these delicious root veggies. It takes longer, but the taste is well worth it. If you're interested in other more traditional touches you can try adding some peas and sauerkraut, although if adding the latter I would dial back on the white vinegar and pickle brine. 1) Drizzle unpeeled beets in olive oil and wrap individually in aluminum foil (if beets are large, cut in half or quarters first to save time in the oven). 2) Peel carrots and place in shallow baking pan, drizzle with olive oil. Place foil wrapped beets in same pan and roast at 425 F until tender. The carrots will likely take about 30 minutes, the beets about 60 minutes. 3) Peel potatoes and boil until tender, about 20 minutes. 4) While the veggies are cooking, assemble dressing ingredients and dice pickles. Set aside. 5) Drain potatoes and dice when cool enough to handle. Place in colander and rinse under cold water to wash off the starch and separate the diced cubes. 6) Remove carrots from the oven and dice when cool enough to handle. 7) Remove beets and take foil off. Rub peels under running water to remove. Dice beets when cool enough to handle. 8) Combine ingredients with dressing in a salad bowl and mix well. Chill until ready to serve. Can be stored in the fridge for 3 days.